I love the "It's a 10" collection because all of the products do 10 different things such as: detangles, softens, reduces frizz, does not create build up, preserves hair color, provides UV protection, hydrates hair and scalp, restores shine, strengthens, and provides thermal protection. The daily conditioner is great because it does basically what a deep conditioner does but it's not at thick or heavy. The Leave in Product is wonderful. I originally bought this for solely to detangle. I put this in my hair after every shower and I love it. I actually think this product does all 10 things. I also love that you can use it wet or dry. I bring a travel size of the Leave in Product because it replaces multiple hair styling products. This line has different products like keratin, blonde, and many others that I'm very interested in trying. I received this as a free gift from Sephora a while back and I became obsessed with it. I saved the last bit for only special occasions when I was running out because I didn't want it to run out, ha! This multitasking hair product does 10 different things such as providing moisture, shine, smoothness, softens, anti-breakage, heat protection, light hold, UV protection, manageability, and strength. The main thing I noticed about this product was how incredibly soft and feather-light my hair felt. The only downside is that this product is $25* which is a little more pricey than usual hair products I buy. I would recommend this product to anyone. I don't think this product is as good as the other 3 products because it feels a little more watery and sticky versus creamy. However, it's a great multitasking product for the money. This product is $7.99* and promises to repairs tough hair, strengths against damage, creates softness, smooths, moisturizes, controls frizz, provides heat protection, manages, and helps tame fly aways. My favorite way to use this is putting a small amount in my dry hair to get rid of frizz and give me a little more moisture and softness. I hope all of these products work out for you! 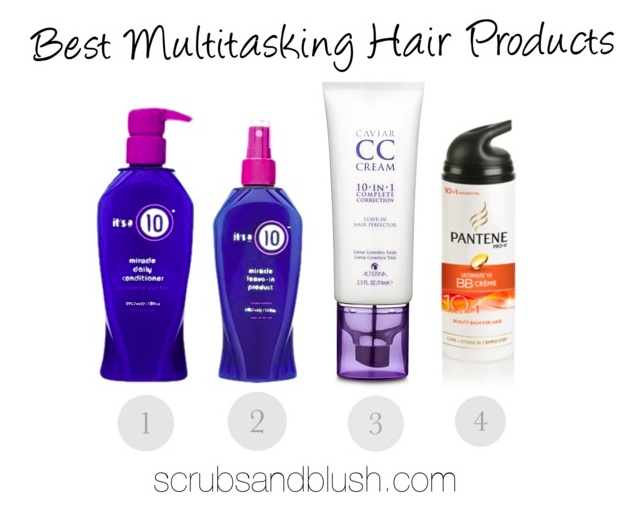 Let me know what YOUR favorite multitasking hair products are.